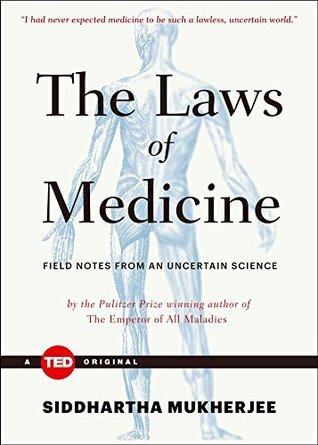 Essential, required reading for doctors and patients alike: A Pulitzer Prize-winning author and one of the world’s premiere cancer researchers reveals an urgent philosophy on the little-known principles that govern medicine—and how understanding these principles can empower us all. Over a decade ago, when Siddhartha Mukherjee was a young, exhausted, and isolated medical res Essential, required reading for doctors and patients alike: A Pulitzer Prize-winning author and one of the world’s premiere cancer researchers reveals an urgent philosophy on the little-known principles that govern medicine—and how understanding these principles can empower us all. Over a decade ago, when Siddhartha Mukherjee was a young, exhausted, and isolated medical resident, he discovered a book that would forever change the way he understood the medical profession. The book, The Youngest Science, forced Dr. Mukherjee to ask himself an urgent, fundamental question: Is medicine a “science”? Sciences must have laws—statements of truth based on repeated experiments that describe some universal attribute of nature. But does medicine have laws like other sciences? Dr. Mukherjee has spent his career pondering this question—a question that would ultimately produce some of most serious thinking he would do around the tenets of his discipline—culminating in The Laws of Medicine. In this important treatise, he investigates the most perplexing and illuminating cases of his career that ultimately led him to identify the three key principles that govern medicine. Brimming with fascinating historical details and modern medical wonders, this important book is a fascinating glimpse into the struggles and Eureka! moments that people outside of the medical profession rarely see. Written with Dr. Mukherjee’s signature eloquence and passionate prose, The Laws of Medicine is a critical read, not just for those in the medical profession, but for everyone who is moved to better understand how their health and well-being is being treated. Ultimately, this book lays the groundwork for a new way of understanding medicine, now and into the future.